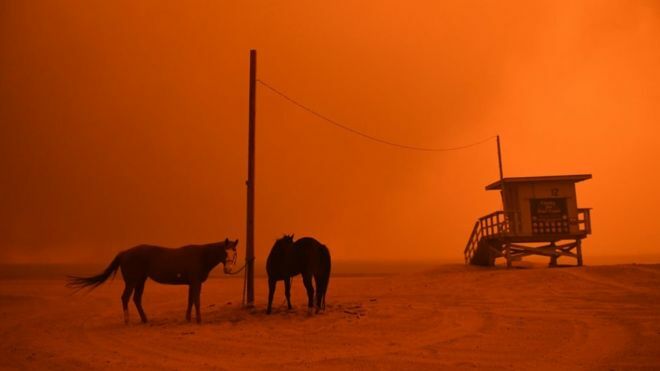 The Woolsey Fire in the background illuminates two horses waiting further evacuation on the beach in Malibu. Many homes in Malibu were burned because the fire moved so fast over the mountains to the ocean. Some people fled in their boats. The Pacific Coast Highway was jammed with evacuees heading into Santa Monica. This Santa Ana event whipped major, historically destructive fires through drought stricken areas AT THE SAME TIME throughout Northern & Southern CA. This is a Getty pic.